CD Label: Victor Musical Industries Inc. This hard-to-find CD was released in 1991 as part of the Victor "Original Soundtrack Masterpiece" series. Rather than complete original mono soundtracks, the disc collects the stereo versions of these scores, previously released on individual vinyl LPs in the 70's. As far as I know, there has never been an individual CD release of "The War in Space", which may partially account for this disc's rarity. 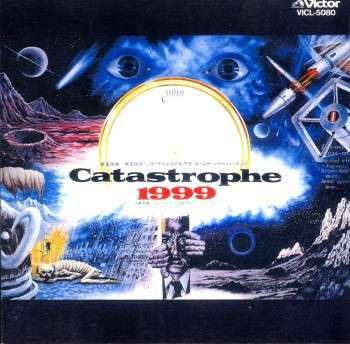 It is also sought after by Tomita fans for the LP version of "Catastrophe 1999", though a CD of the complete mono soundtrack of that film was later released on the VAP label in 1996. The mono and stereo versions of both films were finally collected (in remastered form) on 2001's "Champion Festival" box, also on VAP. "Catastrophe 1999" is presented here as two continuous suites (Tracks 1 & 2), just as it appeared on Sides 1 and 2 of the original LP. It is an eerie, synth-heavy score, mainly consisting of a haunting title theme presented in a wide variety of arrangements - including guitar, orchestra and horns as well as ghostly electronics. There is also a sadder, secondary theme that is first played on a whistle-like synthesizer and later revisited in flute and string versions. The remaining ten tracks are taken from the "War in Space" LP. This score features a more bombastic, military approach - appropriate enough for a film that some say was Toho's answer to "Star Wars". The catchy Main Title consists of a heroic theme that quickly mutates into a funky clavinet jam, topped off with dissonant synthesizer bleeps that seem oddly out of place (they don't appear at all in the mono soundtrack version). This is followed by more conventional themes, including mysterious and suspenseful passages, electronic sound effects and military marches. Both of these works have a distinct 70's flavor, and may appeal to fans of electronic music (in the style of Tangerine Dream or early Vangelis) as well as soundtrack buffs.